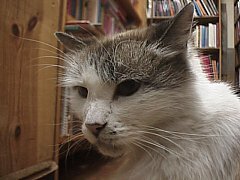 Marcella is the resident kitty at Horizon Books in Seattle. She was one of the first kitties in the shop. 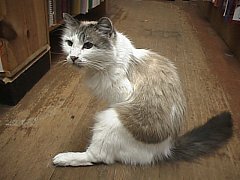 She and her brother Marcello came to the store as kittens and littermates in 1986. Marcella has been there ever since. Her brother mysteriously disappeared a couple years ago. 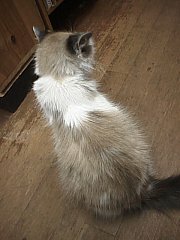 Marcella (pronounced with a "ch" in the middle) doesn't like to be picked up or bothered much, but she can be tolerant of kids. She wasn't real tolerant of her photographers, however. Her ears got flatter and flatter the longer we took pictures. Note: I heard Marcella passed away on April 20, 2000. She had many fans and will be sorely missed.